Further evidence that breath testing in Pennsylvania is not scientific. The Pennsylvania Department of Education and the Institute for Law Enforcement Education seemingly hate science and don’t appreciate taxpayers. It’s that darn whole science is open thing that neither PDE nor ILEE seem to understand. They just continue to provide further fodder for cross-examination and bias. Rather than doing what I normally do and talk about what science is and what it should be, I will simply let the documentary evidence speak for itself and ask, is this really science? 1. I am a taxpaying citizen of the United States and of Pennsylvania. 2. I am a criminal defense attorney. I primarily defend other taxpaying citizens who have been accused of a crime by the government including DUI. 3. The Pennsylvania Department of Education (PDE) is the executive agency of the Pennsylvania Governor that takes and spends my and other Pennsylvania taxpayers monies as well as funds allocated to it by the federal government. 5. 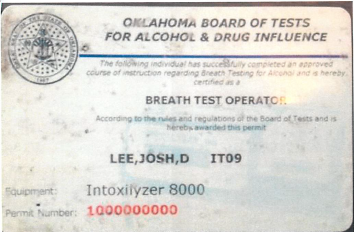 In order for breath test evidence against a motorist to be admissible, the operator of the breath testing instrument must pass the ILEE (PDE) course to become a “Type A breath test operator.” If there is a result and the result is not from an ILEE (PDE) “Type A breath test operator,” the result is inadmissible. 6. Jim Hawkins is the Director of ILE. According to sources, he is a retired Army Lieutenant Colonel with 27 years of law enforcement experience in the United States Army Military Police Corps, serving as Chief of Police at four installations and Commanding Officer of the Criminal Investigation Command in Korea. Prior to military service, he studied engineering at Virginia Polytechnic Institute and State University for four years. He holds a Bachelor of Science degree in Government and Political Science from the University of Maryland. He has completed vehicle collision investigation courses at Northwestern University and the Traffic Institute for Police Services (TIPS) and is an accident reconstructionist. He joined the staff of the TIPS in May of 1995 as a full-time Police Training Education Specialist. Jim is currently ILEE’s Curriculum Development Coordinator, and instructs various courses including the Standardized Field Sobriety Testing course, Breath Test Operator and Maintenance courses, Complete Traffic Stop, High-Risk Vehicle Stops and other related topics. It is clear that he is not a credentialed scientist. 7. Robert Tomaine is an Assistant Attorney with the Pennsylvania Department of Education. According to the PDE website, since 2001 Robert Tomaine has provided legal advice to and worked closely with the Secretary of Education, Deputy Secretaries and Bureau Directors in a wide range of areas including: human resources, school construction, alternative education and federal food programs. On a regular basis, Bob represents the Department in litigation before administrative agencies and the Commonwealth Court. Bob also serves as a faculty member and lecturer for educational programs conducted by the Department and the Office of General Counsel. Prior to joining the Office of Chief Counsel, Bob was a law clerk and attorney with the Pennsylvania State Civil Service Commission. Remember the government and the police officers who rely on Breath Testing claim that these devices are scientific and they are performing science when they use them. The Institute for Law Enforcement Education and the Pennsylvania Department of Education teach science and are beholden to scientific principles in its teaching of “Type A breath test operators” and in its various training courses. I simply signed up for the course. The course that my and your taxpayer money supports and pays for. I sent by certified letter a fully filled out and truthful application to attend the course along with a cover letter. His office received it. I have the signed green card. Two weeks later, I called and talked to Jim Hawkins. He confirmed receipt. He said that his office was reviewing it and that I would definitely get an answer by the end of the year. After I got PDE’s response and reading that if I had any questions that I could call, I did. On January 6, 2014, I called Robert Tomaine. He answered the phone. I told him orally that I would be willing to pay an appropriate fee to attend the course. He said “That’s what they thought you would say.” I let him know that I did not want to sue the state and further expend taxpayer money for what should be basic science. He asked “In federal court?” I said that I didn’t want to that that every other time my colleagues across the United States challenged such a denial, they won. He asked me for evidence of that and that they were allowed to attend. Here is a series of emails that I had with the Pennsylvania Department of Education point person on this issue, Robert Tomaine. Thank you for our brief conversation today regarding your letter to me of January 2, 2014. As I discussed with you over the phone, I wanted to clarify my application and provide for additional information in hopes to change the decision of PDE and ILEE. If it is needed, please allow this letter to serve as a reapplication with this additional information below. The costs associated with my training. Please correct me if I am wrong in the basis of your department’s objections. As to number one, as we discussed, other states have allowed it or it has been mandated upon the agencies who so train police. You asked me to provide details of this. I will get you that shortly. As to the second objection, I am willing to pay a reasonable fee for the instruction. I look forward to your timely response. I think that a response by January 20, 2014 is a reasonable amount of time. Thank you. 2. Oklahoma- offers full Oklahoma specific BrAC training to defense attorneys for a $50 fee. 5. California (Alameda County)-with the changeover form the Intoxilyzer 5000 to the Drager 7110 there was free defense attorney training. I have a $25 cancelled check that should suffice for proof of attendance. I know of perhaps 5 other states, but I think this is enough to demonstrate my point. I look forward to your response by the 20th. Thank you. Upon consideration of all the materials you have provided, my client’s position regarding your request to attend the BAC Data Master Alcohol Breath Analysis Instrument Operator Certification course remains unchanged. I recently learned that, in July 2008, the Pennsylvania Department of Education (PDE) provided you with the complete curriculum of the course except the examination. The materials you were provided, as a courtesy, remain current. With regard to your request to attend the course, my client’s decision is final. PDE views this matter as now closed. Thank you for your time and attention to this matter. Prior to filing and to be fair, do you have case law or other justification that allows you to exclude me when I am willing to pay a reasonable fee and will not provide for a disruption? If you have something, I will consider it. There has been no response. So, they will get my response in court. I guess if you want to work at PDE and ILEE, you have to take the “no science pledge.” I also contacted Tim Eller, the Pennsylvania Department of Education Press Secretary. I left a message. I gave him up to 24 hours to respond. He has not. [G]ood science and good research hides nothing. Everything about the science should be “transparent”, i.e., readily available for review. This includes all of the raw data developed during any study — even the data points that were thrown out or discounted. Having transparency ensures that the study is completely reproducible, allowing others the opportunity to reproduce the results. Studies where information has been lost or is unavailable should be viewed with extreme caution. Without it, there can be no rational criticism and no advancement of scientific knowledge. The same applies for training. Reserving training to a select few that you hand choose will not advance science or scientific thought. In fact, that is how science regresses. It seems as if I have falsified my hypothesis. The Institute for Law Enforcement Education and the Pennsylvania Department of Education does not teach true science and are not beholden to scientific principles in its teaching of “Type A breath test operators” and in its various training courses. It is a closed, insular, and non-scientific entity. All this serves as further evidence that there is no science in breath testing in Pennsylvania.